Wired has an excellent in-depth article by David Wolman: "Fraud U: Toppling a Bogus-Diploma Empire" about the efforts of George Gollin to bring down at least one of the many diploma mills currently operating, St. Regis. The people running the operation are now currently in jail (on charges of mail trafficking and bribing and whatnot), and Gollin is pushing legislation to make it harder to set up operations like this. Gollin keeps a looooong page on Information resources concerning unaccredited degree-granting institutions with an enormous collection of links and some tools for investigating fake degrees. Spiegel online reports that stem cell researchers Karim Nayernia from Newcastle University and Wolfgang Engel from the University of Göttingen (yes, the German university of fabricated publications fame) have withdrawn a paper they published in July 2009 in "Stem Cells and Development" about producing male sperm from stem cells. The research has caused quite a stir, so the withdrawal has also been disturbing. It appears that a large part of the introduction is a self-plagiarism without source from a previous paper published by the research group. Additionally, one of the authors listed on the paper states that he did not read the paper before it was published. Nayernia and Engel insist that the data is valid, and regret the unintended self-plagiarism. Further reports say that the researcher responsible for the plagiarism has been fired. The Frankfurter Rundschau (and the Berliner Zeitung) ran an article by Hermann Horstkotte about the judgment taken in September by the High Court in Frankfurt/Main about a plagiarism case. An honorary professor (who also happens to be responsible for corporate social responsibility at a large German company) hired a ghostwriter in 2002 to write an article for him. The article appeared in a journal under the name of the honorary professor, with just a footnote thanking the true author, who was an employee at that time. Four years later the employee discovers this article in the literature list of the honorary professor. And since this person is now in business for himself, he doesn't like the idea of his own work being used by the other guy, and he requests from him removal of the work from his literature list (which he complies with) and a signature under a cease-and-desist order (which he refuses). It ends up in court, and the court decides, that since the honorary professor is not a "real" member of the university, this is just a normal text-writing contract and is fine. That this is against university policy, German research system policy, and is highly unethical, has nothing to do with German law. A university spokesman said that the university will strengthen its efforts to make it clear that ghostwriting is unacceptable, both for students and for professors. I feel that if the courts make such a distinction between honorary and "real" professors, then we need to get rid of honorary professors. They should be held to the same standards as the rest of us, or they can't print "Prof." on their calling cards. The Fourth International Plagiarism Conference, will take place on 21-23 June 2010 at Northumbria University, Newcastle upon Tyne, UK. The deadline for extended abstracts of 1000 words and proposals is 29 January, 2010. This fourth biennial conference, hosted by plagiarismadvice.org, and sponsored by Ofqual draws together delegates from the international educational community. In 2008 250 delegates from schools, colleges, universities, awarding and regulatory bodies along with commercial organizations from around the world met to share their experiences and expertise in this key area. Jude Carroll, Deputy Director of the ASKe CETL at Oxford Brookes University, UK. Dr Teddi Fishman, Director of the Center for Academic Integrity, US. Adrian Slater, Head of Legal Services at the University of Leeds, UK. Further information and registration details can be found at www.plagiarismconference.org. The blog Mathlog comments in German on a publication in SIAM News by Douglas N. Arnold Integrity Under Attack: The State of Scholarly Publishing. The publication stems from a report on a particularly disturbing plagiarism series involving 5 plagiarisms by the same duo, M. Sreenivas and T. Srinivas. It seems that the first author was a student of the second one and used the professor's name on the paper without his knowledge. However, Srinivas had the papers listed on his publication list at the department. for JPCS lists an editorial board, nor does either describe any process for judging the quality of the conferences. Nonetheless, Thomson Reuters counts citations from JPCS in calculating impact factors. One of the 49 volumes of JPCS in 2008 was the proceedings of a conference organized by IJNSNS editor-in-chief He at his home campus, Shanghai Donghua University. This one volume contained 221 papers, with 366 references to papers in IJNSNS and 353 references to He. To give you an idea of the effect of this, had IJNSNS not received a single citation in 2008 beyond the ones in this conference proceedings, it would still have been assigned a larger impact factor than any SIAM journal except for SIAM Review. Hmm - I have a number of Chinese conferences on my dodgy list. Perhaps Chinese conferences should be excluded from the calculation of impact factors? And journals need to institute some real peer review (and not just payment for publication). It also shows that the impact factor is broken, if it can be easily gamed like this. Arnold summarizes his criticism of reliance on bibliometrics: "Counting can never replace expert opinion." Microsoft has admitted plagiarizing code for the Chinese interface for their MSN-Buddy. Is this the current trend? Plagiarize, and then apologize if caught? I hope not. As previously reported here, a number of German universities are trying to rescind the doctorates that have been granted to persons who either bribed their way to the title, used ghostwriters, or just plain made up their data. Spiegel Online reports that this is a nice idea, but hard to do. German universities are actually an arm of the government, the professors are civil servants. And there are lots and lots of Prussian-style laws (as well as a Nazi law fron 1939 that was used to take doctorates from Jewish scientists, "Gesetz über die Führung akademische Grade") regulating how you go about doing this - or rather, not. The upshot is, that it is not easy to rescind doctorates, and there are lots of lawyers eager to help the poor plagiarists and fancy fraudsters keep their titles engraven in bronze on their front doors. Spiegel online reports that the University of Konstanz is standing by its decision to rescind the dissertation defended in 1997 by the physicist Jan Hendrik Schön. Schön had been working at Bell Labs in the USA on nanotechnology when it was revealed in 2002 that he was inventing the work he was publishing about. He was fired and a long discussion about scientific integrity and the peer review system began. In 2005 the University of Konstanz used a passage in their dissertation rules to pull the doctorate out from under him: a doctoral title can be rescinded when the behavior of the person after obtaining the doctorate demonstrates that the person is unworthy of bearing such a title. Schön objected on the grounds that his dissertation was okay, the fakes only came after. It has taken the university 5 years to decide to stand by their decision. While I applaud the decision, I do wonder if it really needed five years for this. Schön's only recourse now would be through the court system, and that may take even longer. Spiegel reports that in a recent case involving the University of Bonn, it took the courts eight years to decide in favor of the university rescinding a doctoral title. Writing profession is gaining popularity now-a-days. You can find number of professional writers who can write your dissertation at low cost and less time. Writing a professional dissertation requires years of experience, professionalism and ability to do in-depth research. How many grammar errors are in these three sentences only? I was suspecting a Far Eastern company, but the registrar of these (and two other domains, both paper mills) is in Manchester, but is a generic registrant. I still have the feeling that this is a non-native speaker of English, perhaps Indian, writing. Maybe it is one of the owners of sham colleges in England, branching out in related fields. For attaining good grades in your dissertation it is essential that the dissertation you write must be non-plagiarised. Make sure the dissertation writer you hire provide completely Plagiarism-free dissertation. Maybe it would be a good idea if your dissertation writer advertiser could also operate a spelling checker. According the the NDR, the German research funding organization DFG has decided on the punishments for the involvement of 13 researchers in listing invented publications on their report about past funding and request for new. Two professors for agroecology, the speaker of the research team (Sonderforschungsbereich) and the leader of a graduate study program (Graduiertenkolleg), have been suspended from holding any sort of office within the DFG for three years. The DFG found that they should have been examples of good scientific conduct for the people they were training, and for failing this, have been suspended. Three other scientists will be issued written reprimands. The reasoning is that their careers are not to be destroyed, but it is to be made clear that inventing publications for a report on funding is unacceptable. In all, 54 publications by 13 scientists were found to be non-existent, additional publications were falsely noted to be already published when they were, in fact, only submitted for publication. Additionally, the University of Göttingen will have to pay back an as yet undisclosed sum of money, and there are criminal charges of fraud being brought against the speaker. A colleague was bragging that he had a paper accepted at an international IEEE conference in China. Since IEEE has often been found to support so-called bogus or fake conferences (ones that accept any paper, even those generated by SciGen) and since I was on vacation with internet access and time on my hands, I decided to have a look. IEEE has a site that can be used to search for conferences, so I looked for conferences in Beijing in 2009. Amazing, there are 23 IEEE conferences this year in Beijing! Okay, China is a large country. I idly flicked through a few of them, when I realized that the contact person for an number of them was given as Prof. Mengqi Zhou. More research turned him up as Chairman of the IEEE Beijing Section, and 10 of the 23 conferences listed him as the contact. Now I was really curious, so I spent a good bit of time researching the conferences. Some appear to be legitimate - they have a venue listed on their web page, they have a small range of topics listed, there is someone more or less serious-sounding as the contact. 2009 2nd IEEE International Conference on Computer Science and Information Technology (ICCSIT 2009), Beijing Convention Center 8-11 Aug 2009  350 ? ? ? No web site any more, just notice that proceedings have been sent to authors already. Contact address is given at a Chinese news/freemail account. Chinese news/freemail account. No information on venue on web site except for advertising for "Hot Spring Liesure [sic] City"
2009 IEEE International Conference on Communication Technology and Applications (ICCTA), Hotelecom Hotel 16-18 Oct 2009  150 3 1/2 weeks July 20 $400 / $50 Only one page functions on home page. E-Mail Beijing University of Posts and Telekommunications, wnwang@bupt.edu.cn (Weining Wang). 2009 2nd IEEE International Conference on Broadband Network & Multimedia Technology (IC-BNMT 2009), High-Tech Mansion BUPT 18-20 Oct 2009  200 3 1/2 weeks July 20 $400 / $50 E-Mail contact Beijing University of Posts and Telekommunications, wnwang@bupt.edu.cn (Weining Wang). "Each article should be within 4 pages, otherwise USD60 will be charged per page of the extra pages of your article. The first author who has 2 papers should pay one registration fee and USD60 per page of the second paper." 2009 IEEE International Conference on Network Infrastructure and Digital Content (IC-NIDC 2009), Academic Communication Center, BUPT 6-8 Nov 2009  180 3 1/2 weeks Aug 15 $400 / $50 E-Mail contact Beijing University of Posts and Telekommunications, wnwang@bupt.edu.cn (Weining Wang). Registration form identical to  and , Registration venue given as Beijing Hotelecom Hotel. Ms. Weining Wang is listed as the Director of Academic Office, BUPT. She also appears to be the contact for IEEE NLP-EK 2007, IEEE IC-NLP 2005, China-Ireland International Conference on ICT (CIICT2008), the 19th International Teletraffic Congress ITC19, The Asia-Pacific Network Operations and Management Symposium 2008, ICHS 08, and is Deputy Editor-In-Chief of the Elsevier-published "Journal of China Universities of Posts and Telecommunications". Maybe she is the one in the office that speaks English, but I find this mighty strange. I believe that the conferences ,  and  are bogus conferences. , , and  are questionable. Am I being paranoid here? I wrote to the IEEE president when I published my blog entry on fake conferences, but received no reply. Comments? Müllensiefen, D., and Pendzich, M. (2009). Court decisions on music plagiarism and the predictive value of similarity algorithms. Musicae Scientiae, Discussion Forum 4B, 257-295. The duo runs a company that sells expertise in the area of musical plagiarism. Sorry for the inconvenience, but there has been so much Japanese spam advertising for medicinal compounds lately, that I've turned on captcha and moderation for older posts. A German researcher about plagiarism in China, Lena Henningsen from the University of Heidelberg, passes on this great article about plagiarism and cheating in China: "No stopping China's cheaters", by Stephen Wong, Asia Times, Aug 22, 2009. Organized cheating on college exams is rampant. A novel experiment in detection of cheating on exams found that young pupils made much better proctors, catching two and a half times more cheaters than the adults did. The average age of the pupils was 12 years old. Wong notes that "A commentary of the national Guangming Daily newspaper stated that adults don't lack the eyes to see problems. They lack the courage to expose them." There is an examination law being proposed, but the question of enforcement lurks unsolved. Southwest Jiaotong University vice president Huang Qing has had his dissertation revoked. He has protested that it was "only 7%" and doesn't understand what the fuss is all about. Tsinghua University has developed software that supposedly detects plagiarism. But it doesn't detect much, there is counter software available that helps people "fix" their stolen papers. I think the comment from Guangming Daily is spot on for the Western world as well. We see problematic behavior (read: scientific misconduct of all shades and strengths), but we lack the courage to call people out on their misconduct. Thanks for the link, Lena! A reporter for the Frankfurter Rundschau has made it clear that the Cologne district attorney's office was a little imprecise in saying that 100 honorary professors were being investigated. What was meant was that over 100 "außerplanmäßige" Professors (apl. Prof.) are being looked into. There is a difference. An honorary professorship is something like an honorary doctorate, only one step up the ladder. An apl. Prof. is one that is "outside of the plan". That means, they get to call themselves Professor, and they have to teach, but they don't necessarily get paid. Many of these people either have a German second doctorate (Habilitation) or they were so-called "Junior Professors" that got to be "real" professors straight from their doctorates for six years and then failed to find a job-for-life. This introduces a strangeness to the cases. If tenured professors were to take a bribe, they are looking at fines, prison, and perhaps being stripped of their pension. But since these apl. Profs are not paid, there's not that much of a problem in them taking bribes. So who is to blame? Well, what are these faculty boards and dissertation committee doing during their meetings about the dissertations? Did no one read and thoroughly research the work done? Did they just rubber stamp the proposals and hope that the meeting was over in time for dinner? The hard part is: how do we get this sorted out? In Sweden it would be simple. All public service documents are in the public domain. Some reporter with time on hir hands would ask for the list and start making calls. In Germany we have "data privacy" laws that are very useful in situations like this. And since it is not the national government, but the individual states that run the universities, there are 16 "Kultusminister" or "Wissenschaftssenator" that have to check out their own house. In a fantasy world, each state would request the list of their own institutions from Cologne and call in some university presidents for some hard discussions. They might even cut budgets from departments that granted degrees that show up on the list. Oh, and there are apparently over 200 names on the list of grantees, just 100 apl. Profs. that participated. Stay tuned, but don't hold your breath. Thanks to W. Cloud for finding this gem! The Cologne district attorney's office has completed its investigation after having confiscated papers found while searching the offices of the Insitute für Wissenschaftsberatung in Bergisch-Gladbach. They had been in business for over 20 years. The University of Hanover took back nine doctorates in March 2009, when they discovered that the professors "mentoring" the theses had taken bribes to do so. 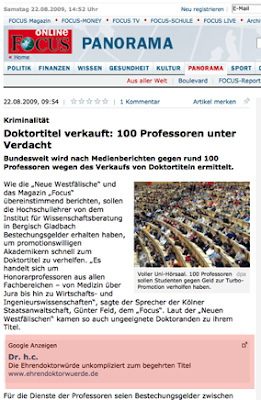 Now Focus, Neue Westfälische Zeitung, Spiegel Online, and Tagesschau report that over 100 other doctorates have been found to have been granted on the basis of bribes. District Attorney Günther Feld has confirmed the press reports that professors from the Universities of Bayreuth, Berlin (Free University), Bielefeld, Cologne, Frankfurt/Main, Hagen, Hamburg, Hanover, Ingolstadt, Jena, Leipzig, Rostock, and Tübingen are involved. Many different fields are represented, among them law, medicine, sociology, business administration, engineering, and veterinary science. The customers paid the institute between 4000 and 20 000 Euros for finding an "appropriate" mentor and topic. The professors received between 2000 and 5000 Euros for taking on the customer. In general, however, it was not the tenured professors who were caught, but honorary professors, who have been given the status of a professor, and the right to mentor doctorates. They are required to teach a course every year to keep their titles, but are not paid. The departmental boards of each school, however, are normally involved in the granting of the doctorates. It is not clear why none of them complained or stopped any of these degrees. The conviction of a law professor from Hannover on bribery charges is now final, he was sentenced to three years in prison and fined 75 000 Euros. He had appealed to the Federal High Court of Justice, but they refused to hear the case. Spiegel Online also has an interview with the Munich professor for business, Manuel René Theisen, who has been fighting against companies such as the Bergisch-Gladback institute for over 25 years. See the update on this case! There were reports in June 2009 in alternative media (The Local, Realtid.se, Swedennews) that Johan af Donner, the communication officer for the Swedish Röda Korset, was not only remanded into custody charged with defrauding the Red Cross of more than 2.5 million SEK (about 250.000 €), but had also defrauded the Swedish Cancer Society of another 3 million or so when he served as their head of donations. He also misused the Red Cross business credit card for personal expenses. During the investigations it came to light that af Donner had also apparently falsified his qualifications, using liquid paper on a copy of a degree from a friend. He left both copies behind when fired from a previous company and made to leave immediately, according to Realtid, an online business zine that has been closely following the case. The link is in Swedish, but there is a picture of the falsified document, presumably before being fotocopied. The University of Stockholm has determined that af Donner was enrolled in a business administration program but was never granted a degree. af Donner was released from prison four weeks later, since the government had by then managed to freeze his assets, in particular the money he made by selling off his apartment in a fancy part of Stockholm (Ostermalm) just before the Red Cross story broke. A crony who helped in the fraud by sending made-up bills has also been identified and charged. In other news, the Red Cross Hospital in Stockholm has to close because they have no money. They are, however, economically separate from the Swedish Red Cross, so the officers of the Red Cross deny that there is a connection here. The Washington Post reports on the reporter who had to leave the New York Times because of plagiarism. It is rather strange that this is newsworthy, but maybe in order to show that there can indeed be life in a different field after such a scandal. I'm glad he's found a job and seems to be doing well at it. How do we deal with accusations? In a previous blog entry I demonstrated an example of what I called "CV bloat" with reuse of previously published material. I wrote to the person involved and asked if he could give any clarification on the matter. He wrote a very nice letter back, explaining the situation. The DFG rules go on to describe a long process that must be conducted in utmost secrecy. Indeed, I can see that this is important in a case where we have A and B, each with a copy of the same text, and it must be determined who copied from whom. And it would be important for the accusers to be able to remain anonymous, although in many cases that I see (doctoral theses copying word-for-word from diploma or master's or bachelor's theses they mentored) it is trivial to guess who must have blown the whistle. But how can we discuss questions of what is acceptable and what is not, if we do not do it publicly? No one will discuss the topic unless there is a concrete case at hand that starts people thinking and asking questions. I have spoken about this reuse with a number of colleagues in the past few days and have found that many do not find this to be a problem, although I have pointed out that in many grant applications and applications for professorships only a quantitative analysis of the CV is done (I must emphasize that in in this particular case it was an online CV, not one used for any particular purpose!). If on the one hand it is okay to reuse text in multiple circumstances without referring to the previous usage, then we shouldn't be just counting publications as if they were beans. If it is not okay to reuse text, i.e. publish the same text in multiple venues without referring to the prior publication(s), then we have a problem on our hands. How do we go about telling active researchers that their current practice is not okay? How do we tell beginning researchers what is considered to be out of line? I find us coming back to the question often asked me by students: How many words to I have to change so that it is not plagiarism? I feel very strongly that we need to get discussions of all facets of scientific integrity out of the closet, so to speak. We need to discuss openly what options are available for reusing text - among many, many other topics such as "cleaning up" data and ghostwriting and making up publications that never happened and all the little things that come out now and then. Or am I too far off base here and should this be done behind closed doors? She puts an encouraging comment on a year-old entry from my blog and hopes that I don't see the spam link to buy term papers online. Luckily I check all links. What a shame that Suzi's profile is locked. I surfed to the site which promises high-quality term papers. Might I note that their home page could use a spelling check? And maybe a brush-up on English grammar? Curious, I did a whois-lookup. The domain was first registered in June of this year. They are hiding behind a "protected domain service" that does not enter in any human being names, but just the registrant. Should these people exist, and be running a term paper mill, I think that their doctorates should be rescinded. Russell says that his doctorate is in Chemistry from Alabama State University. I wanted to ask ASU what they think of this, but they don't appear to have email yet. A search of the (rather bad) home page turns up a few telephone numbers, but no email or home pages. A quick Google for the other four names turns up another paper mill that just happens to have the same people on the board, but no other links. Just as well - if you buy a fake paper it should be from a fake company. A Low-Budget Autonomous Mobile Robot for Outdoor Tasks. 7th International Workshop on Research and Education in Mechatronics REM 2006, Stockholm, 15.6.-16.6.2006. Autonomous Mobile Robots for Outdoor Tasks. 2. Wernigeröder Automatisierungs- und Informatiktage, Wernigerode, 12.-13.10.2006, S. 161-168. I wondered what the difference was. So I downloaded them, and discovered that the major difference is in the formatting. Oh, there is a figure dropped and a sentence added and a paragraph or so removed, but even a misspelled word such as "Acknoledgement" is in both papers. Oh, wait - the list of students contributing to the work is missing in the Wernigeröde paper, and the word "proposed" has changed to "developed". It is, after all, three months later. Autonomous Mobile Robots for Outdoor Tasks. MSM 2007 - 3rd International Conference on Mechatronics and Materials, Kaunas, 27.-29.9.2007. Hmm. Prof. Loose has lost his co-author - but except for formatting, this paper is identical to the Wernigeröde one. Same text, same figures, same data. The only difference seems to be that he's used a spelling checker and fixed the spelling of "Acknowledgement". But for all practical purposes, we have three papers that are identical material. Two have the same name, but different authors (one being dropped). They are identical, except for the formatting. Two have the same authors, but in different order with different paper titles, but they are for all practical purposes the same. Prof. Loose has bloated his CV with three publications by recycling not just the content, but also the wording. Ms. Lemke does not seem to be at the FH Brandenburg any more, although her CV would have two papers for the work of one. Neither of the later papers refer to the previously published ones. Perhaps the papers were never "really" published and are only available online. But I do feel that the newer ones should refer to the older ones, and the identical papers should have identical authors. I have asked the author if he cares to comment. Update: I wrote to Prof. Loose and asked if he could give any clarification. He wrote a very nice letter back, I've decided to write a new blog entry on a point that he raised there. He explained that the first two papers were not to be considered scientific papers. They were just the written form for talks given at small workshops. And the order of the authors was switched so that the first author was the one giving the talk. He himself is mystified by the third paper as to why the second author is no longer on the page and will check it up when he gets back home. I wish to thank him for a speedy answer! Update 2012-07-15: Prof. Loose's home page is linked from his school, but completely unaccessable. The New York Times reports that the publisher Elsevier (I have previously blogged about them publishing fake journals for pharmaceutical compnaies) published some of 26 scientific papers that the pharmaceutical company Wyeth paid ghostwriters to write about some of their products. The ghostwriters come from so-called "medical writing companies". This has come to light from legal research involved in more than 8000 lawsuits directed at Wyeth. The article in the NYT demonstrates the exact ghostwriting process for one of the papers, and names the unethical professor supposedly having written the paper. She insists that she contributed to the paper by phone and not just by the email messages that have been secured, and that the paper reflects her views on the topic. Where do we draw the line, and how do we prevent this from happening? The paper is surely on her CV. Spiegel Online reports on the recent judgement brought against the anthropologist Professor Dr. Dr. Reiner Rudolf Robert Protsch von Zieten (FamousPlagiarists profile SCMD-2005-RPVZ). He has been convicted of stealing 278 chimpanzee skulls from the Johann-Wolfgang-Goethe University in Frankfurt am Main, Germany, faking numerous certificates and documents, and selling the skulls for his own gain. He was sentenced to a remanded 18 month's prison term. The 70-year-old anthropologist, who has been a professor since 1973, does not even seem to have completed high school, according to the FAZ, much less completed a doctorate, although he regularly used two in his title. He was awarded his professorship on the basis of a Ph.D. certificate, supposedly from an American university, UCLA. His second doctorate, from 1996, was awarded from the University of Vienna. He was fined for using this title before the examination had occured. On his birth certificate there is only "Protsch" listed, the name of his father. He cannot prove why he calls himself "von Ziethen", the name change appears to have been around 1991, according to the Wikipedia entry on him. He had often been the target of discussions in the past. People questioned his abilities at dating bones. He pretended to have developed methodologies that were actually due to other researcher. He presented bones as being from different places than where they were actually found. He plagiarized other's work, liberally. There were many accusations of plagiarism, but none stuck. The FAZ had complained in 2005 that nothing was happening, but even the complaint didn't help much, although he was finally forced to retire. He had even "donated" items to a museum, pocketing a donation receipt. The items, however, belonged to the university, and were doctored by him to make them more interesting for the museum. It was when he was finally caught with his hand in the proverbial cookie jar that he was brought before a judge. He stole a famous skull collection from the university and sold it for 70,000 $ for his own pocket, according to Spiegel. He also had student researchers scratch property notices off university bones so he could call them his own, and he had university stamps removed from books in which he then affixed his own. The German Wikipedia has a long and detailed list of the different accusations. The Skeptic's Dictionary has a very detailed entry on him (in English). His former university web pages are available in the Internet Archives, however the University of Frankfurt/Main has no statement on its web presence about him. So we have justice at last - he will not be enjoying a government pension. But the case does, indeed, demonstrate how easy it is to get away with academic dishonesty in Germany. The SEPLN´09 Workshop PAN, "Uncovering Plagiarism, Authorship and Social Software Misuse" ran an international "Plagiarism" Detection Competition this year and have recently published their results. I've put the word plagiarism in quotes, as my definition of plagiarism encompasses much more than just character sequence matching. Copies and near copies can perhaps be detected by a programming system, but the determination of plagiarism is something that only a teacher can determine, as there may be legitimate reasons for copies (they are part of properly quoted material) and a structural plagiarism can exist where no exact copy can be found. Corpus size: 20 611 suspicious documents, 20 612 source documents. Document lengths: small (up to paper size), medium, large (up to book size). Plagiarism contamination per document: 0%-100% (higher fractions with lower probabilities). Plagiarized passage length: short (few sentences), medium, long (many pages). Plagiarism types: monolingual (obfuscation degrees none, low, and high), and multilingual (automatic translation). They have a development corpus that annotates the copied portions, so that researchers can train their systems. The competition corpus is, of course, without such annotations. They calculate precision, recall, and granularity for each of the contestants on a character sequence level. Precision is the name given for how many of the detections were correct. Recall is the amount of plagiarism that was there was actually identified. Granularity demonstrates how often a particular copy is flagged - this should be close to one, that is, that any given copy is found only once. They split the competition into external copy identification (but for a given, finite corpus, not against the open Internet) in which a matching with a given set of papers is to be found, and an intrinsic plagiarism identification, in which a stylistic analysis without use of any external documents is to identify the plagiarisms. The results are, as I expected, wildly different between external and intrinsic. I find the recall values important - how many of the possible copies were found, although the precision is also important, so that not too many false positives are registered. The recall for the 10 systems doing the external identification ranges wildly between 1 % and 69 % of possible copies found. This corresponds with my results from 2008 with a small corpus of hand-made plagiarisms and hand-detection, in which we found a recall of between 20% and 75% (the ones finding nothing were disqualified in our test). The median recall of the competition is 49%, the average 45%, which validates my informal assertion that flipping a coin to decide if a paper is plagiarized is about as effective as running software over a digital version of the paper (of course, flipping a coin gives no indication as to what part is indeed plagiarized). The precision ran between a median of 63% and an average of 60%. The intrinsic identification was quite different. Although the recall was good (median 51% and average 56% with one of the four systems reaching 94%), the precision gave a median of 15 % with an average of 16%. The best system only had 23 % correct answers - that means that over 3 in 4 identified plagiarisms using stilistic analysis was, in fact, incorrectly flagged as plagiarism. This has interesting ramifications for stylistic analysis. The overall score (I am not sure exactly what this is) has a median of 32 % and an average of 29% over all of the systems for recall, and a precision of only 39 % (average 28%) on precision. I can identify only two of the authors as having written software that I have tested. The group from Zhytomyr State University, Ukraine, are the authors of Plagiarism Detector, this system was removed from our ranking for installing a trojan on systems using it, although their results gave them second place in my test (overall fourth place in this test). I also tested WCopyFind, but this is a system that is for detecting collusion. It's recall was overall about 32 %, but with less than 1 % precision it generates a *lot* of false positives! A short film was shown this morning as an introduction to use of new media in the classroom from Kaplan University. It is a well-made film with a black professor apologizing to the class for not being media-hip - and that then being transported to all sorts of devices. The Wikipedia notes that this is the "doing business name of the Iowa College Acquisition Corporation, a company that owns and operates independent, private, for-profit, colleges". Rip-off Report no textbook to read, just exercises to hand in that always come back with a grade "A"
They have an online (!) nursing program "accredited" by the "Commission on Accreditation of Allied Health Education Programs". I can't find much on them, except advertising sites for online education that say that this is legit. But I don't see them on official lists (except the Wikipedia, and I don't trust it for something like this). Please drop a comment with a reference if this is in line. How can you do nursing by distance? Complaintsboard: A number of stories here. Slick films, but I think I need more convincing that this is a legitimate university. Michael Leddy posted this note about a bit of a stir that is on at Jacksonville State University in Alabama, USA. The president of the university, William Meehan, was granted his doctorate from the University of Alabama. There has been determined that there is an enormous amount of, shall we say, correspondence, between that dissertation and the dissertation of Carl Boening, who was granted a doctorate a few years earlier from the same institution. Meehan's thesis does admit that it is duplicating a research method with a different population. But just duplicating the method does not warrent word-for-word copying from the text. Interestingly, there are three professors who were on both dissertation commitees. Apparently, Meehan's committee approved the duplication of the method. It does seem strange that they did not pick up on over a third of the thesis being a copy. The case was published in USA Today in April 2009. They report that the investigation was started because Meehan had seized a large plant sample collection from another professor and his lawyer is accusing Meehan of having a history of stealing academic work. The Committee has found no discernable evidence that President Meehan knew or had reason to know that articles written and released over his name and office contained plagiarized material. At least that cost him a job at a fancy Georgia Football College, Valdosta. The University of Alabama reviewed the similar dissertations, USA Today reports, and is not taking action because one professor from the committee is at another institution and one has passed away. Case closed. Ignore. Water over the mill. The Tuscaloosa News reports, however, that the dissertation adviser was not involved in any sort of University of Alabama "review". It does somehow smell of something getting swept under the carpet. Sorry I haven't been blogging much lately, I've been giving many talks on plagiarism. Today's talk on plagiarism was for a real crowd. About 200 had been my largest crowd to date, but today I had about 260 listeners! There was no protesting that I don't need a microphone - without it, I would not have been to be heard. Luckily, I had a suit jacket on with pockets, so I had a place to park the microphone unit. two eager signers who spelled each other every 15 minutes, so that the deaf teacher could follow what I was saying. that was blocked out by the signer. I eventually retreated to the lecturn, but it wasn't really that good. One of the signers then realized the situation, and took a step backwards when she took her position center stage. Now I could see everyone. they signed the word plagiarism. They held up their right hand, fingers streched and thumb at the side: this is writing. With the left hand they "pulled" a copy off the page, do it is writing-copying. Okay, I asked was it not perhaps writing-stealing? They signed the question to the deaf teacher, she replied very insistently, that writing-stealing was a much better sign, it was similar to the copying motion, but was very clearly a "taking" motion. So now I know the word plagiarism in one more language! Bizarre. An Ohio high school discovered that a student had hacked into the school computer system and stolen the final exams. Half of the student body either cheated or knew of the cheating and said nothing. So the adminstration cancelled the graduation ceremonies. For such a widespread scandal, I would say that was a good reaction. They sent the diplomas home to the parents. The parents, however, set up an alternative graduation ceremony. With all the trappings. Teaching their kids that getting caught cheating is just a little annoyance, a bump in the road. Nothing to get worked up about. The comments make me sick. There seems to be a lot of supporters for the cheaters. I suppose this class of '09 will be using the paper mills to get their bachelor's degree and get their Master's from one of those sham colleges. I stumbled upon the archives of the Colby, Bates, and Bowdoin (CBB) Plagiarism Resource Site. This site was developed between 2003 and 2007. There is an interesting collection of materials available, licensed under a Creative Commons license that lets other schools use the materials if they are used non-commercially, with attribution, and the resulting materials are also put under the same license. It is a shame that the site has not been able to continue its development, but there are many good things to be found here for people who believe as I do: Teach, don't police. The Märkische Oder Zeitung (among others, it is a dpa story) reports that the Spanish Nobel Laureate for Literature Camilo Jose Cela (1916-2002) has been accused of plagiarism. A judge in Barcelona has determined that there is enough evidence that the novel "La cruz de San Andrés" (The San Andrés Cross) for which he was awarded the Spanish literary prize "Planeta" in 1994, is similar to a novel by the relatively unknown author Maria del Carmen Formoso. The newspaper "El País" reports on April 21 that the judge's decision is based on an expertise prepared by a scholar of literature. The court case is being brought against the publishing house Planeta, since Cela died in 2002. Formoso hat submitted her work to the prize committee two months in advance of Cela's submission. Formoso accused the publisher of giving her novel to Cela so that he could use it as a basis for his own work. Formoso has been fighting for 10 years to get legal recognition of her case. She has twice lost cases in lower courts, but in 2006 the spanish constitutional court ordered a new trial. The court in Barcelona was requested to decide whether sufficient evidence is given to re-open the trial, which they now have done. I purchased a copy of the book "Student Plagiarism in an Online World - Problems and Solutions", IGI Global, 2008 by Tim S. Roberts (Ed.) for my research group despite the outrageous price (180$). I have previously blogged my opinion that IGI Global is a write-only publisher, and when I hold the book in my hands, it becomes even clearer. The book is hard-cover, in an impossibly large format, and very badly bound. At that price, I want a book that is well-bound and lies flat for use. There is no trace of the promised "free" online access to the text, which is a shame, as I could have used it today. Many of the chapters are long-winded or repetitive, that is, they could have used some tighter editing. But there are quite a number of good ideas to be found here and the references sections are quite extensive. The chapter by Frankie Wilson and Kate Ippolito, supposedly of Brunel University in the UK, although I find no home page or email for them there, contains an excellent lesson plan for a seminar about plagiarism. I decided at short notice to ditch my normal slideshow about plagiarism that I give to our first semester students and gave it a try, although the materials promised to be at a particular school page are not available (they return a 404). Our session is 90 minutes, and since we had not had an introductiory session yet, I spent 30 minutes with introductions of me and the students among themselves. This helped break the ice - everyone had already had to stand up and say something. We began by collecting definitions on index cards from the students on what their definition of plagiarism is. I made this into an individual exercise, in the plan given this is to be group work. I read them aloud and collected the high points on the board. About a quarter of the 32 people participating could not come up with a definition, and many focussed their definition on product plagiarism only. We then began to discuss "where to draw the line". We did this in plenum instead of in small groups, and this ended up being a lively discussion with excellent questions being voiced from the students. A major concern was: but how do I know what the source is, I just "know" something, I don't remember where I read it. We had a good conversation about note-taking and finding confirming evidence for that which one thinks one knows. The last section dealt with plagiarism avoidance - how a paper gets developed (and I got some words in on that ancient thing called a l-i-b-r-a-r-y) and the different kinds of references: direct quotation, indirect quotation, secondary source. I then distributed 10 magazines and books to groups and have them find how references are used in these. I chose a selection of magazines and books that have different reference structures. They were very quick to identify these, and spent a few minutes glancing through the material that they had. We needed just 60 minutes, although the discussions were going so well that I am sure that we could have made it much longer. I would have liked to have had the worksheet promised in the chapter, but the lesson plan is well enough done that it can easily be adapted. I will post an update if I manage to find the material, I have written to the school asking for current emails of the authors and/or a current URL for the material. Some interesting articles have shown up recently about the topic of "contract cheating" - students using Web 2.0 bidding sites to find a lowest bidder willing to do their homework for them for a price. Often, the coders or writers are to be found in developing countries. Clark and Lancaster have some great resources available, for example these screen shots of contract cheating in action or a list of 138 (!!) sites that offer the possibility of hiring a contractor. They have also set up an entry in Wikipedia on the topic. In German, Spiegel Online author Sebastian Wieschowski has also reported on this phenomenon: Bestnoten mit Billigcode aus Bangladesch (good grades with cheap code from Bangladesch). According to the German online magazine Spiegel Online, the University of Hanover has taken back nine doctorates in law which were granted between 1998 and 2005. A law professor, Thomas A., from the university had taken in much money from lawyers and judges who wanted to have the coveted "Dr." to put in front of their names. Unlike the States, where the President, Vice President, and First Lady all have JD degrees but don't get called "Dr.", in Germany you can have the title put on your passport, bolted on your door, and make everyone call you "Dr. X". At least eight lawyers (a number of them public servants and district attorneys) and one judge so desperately coveted that title - but didn't have the time to do the work - that they engaged a "doctoral consultant". They paid the company, in this case the "Institut für Wissenschaftsberatung" in Bergisch Gladbach, a fee, the company bribed the law professor, and they were soon awarded their degrees. Fifty-nine more cases are pending. Prof. A. took in over 150,000 Euros from candidates, receiving 2000 Euros for accepting a candidate and getting a bonus of 2000 Euros when it was completed. The potential doctors paid up to 25,000 Euros for their titles, for which there is normally no fee assessed. A. was taken to court and found guilty of being bribed. He was sentenced to three years in prison, which is enough so that he loses his pension as well. The scam came to light as students requested in 2004 that A. not be on their examining committee because they did not want to appear to have purchased their grades. The university informed the legal authorities, who began an investigation. In September 2007 Prof. A. admitted to his deeds. During the court case in Hildesheim it was discovered that he not only took money, but also sexual favors for better grades. The company is now bankrupt and the consultant, Martin D., has been in prison since the middle of last year on charges of bribery. He was sentenced to 3 1/2 years in prison. decision on a technicality. Having to explain why the doctorate has suddenly disappeared might put a damper in one's career, although the person who had his doctorate taken back from the University of Tübingen on charges of blatant plagiarism has just gone to another university and taken a doctorate there. That university sees no problems with this.